I bought a box of Ghiradelli's Double Chocolate with Walnut Brownie Mix. It's 90 degrees in Vegas. I want the brownies but I sure don't want to heat up my home making them. The box recipe calls for 40-45 minutes at 325F. When I use the Global Sun Oven, it take an hour and a half at 275F. What to do? Bring in the "equalizer" (pictured). Let's almost double the GSO's reflective surface and get this cooked in real time. One Hour later...delicious. Mission accomplished. Now that's the way to "turn up the heat" with a big booster. How about trying an Angel Food Cake with those temperatures! Brad, Can you give me some more information on what you built and how I can duplicate it? Thanks. I spent a little time working on the glass to gasket seal, and this past week, with a low January sun, got the oven to 400F with my reflector contraption. I've heard a lot of people say that slow cooking is fine, and they don't want the oven to get up that high, but it's nice to know that when you need it to get that high, the GSO can handle the heat. Just wanted to add that the brownies cooked great, but I did notice that my lower left corner of glass was not contacting the seal. This dropped my potential temperature, and I know that others may also have this problem over time, which is why I'm discussing it. I keep my GSO outside, and I use this oven A LOT. The sun in the Vegas Valley is harsh, and I never did pre-treat the wooden frame. Over time, the oven door will pull the hinge upward, compromising the glass to rubber seal contact. I solved this by simply taking the reflectors off, and resetting the hinge with larger stainless screws. The quality of the seal makes a big difference, and I have gotten away with not having to address the problem, but using my reflector insert when conditions are not ideal. As for windy days, the insert can be a problem, especially if I'm pitching the oven forward to catch a low-angle sun, with the help of the telescoping back leg. When I do this, I fill two plastic bags with rocks, and hook the bag handles onto a binder clip clamped to each back corner of the oven. The oven's incredibly stable after that. If you've ever tried to serve out of the leveling arm of the GSO, and had your pot move around, another user pointed out that you can put wing-nuts on the threaded posts of the leveling tray, giving you a quick half-turn way to secure the tray while you stir, serve or add to your cooking vessel. 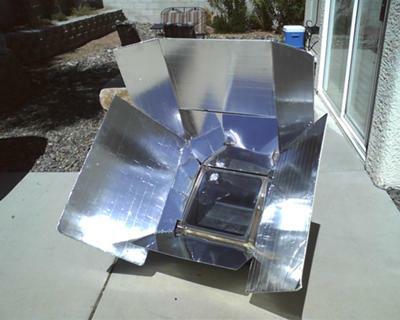 Many users of the GSO complain about the condensation that builds up on the glass and the Solar Chef pointed out that you can place a tea towel between the lid and pot, to catch excess water, keeping off the inner glass. It works pretty well, but so does opening the door for a few seconds. That's all for today. Enjoy your sun ovens. Excellent and very helpful information!